I have a backlog of outfits that I want to share with you! I have been pretty diligent about taking pictures of what I wore to work, but I always forget to post them. Anyway, here's another outfit that I wore last week. It's finally Friday!!! My friend and I are going to have a dineLA night tonight. Super excited! It'll be the second restaurant I'll be checking out. I went to Cafe Bizou last night and their tiramisu was soooo delicious. It was definitely a good end to an awesome meal. A highly recommended place! I usually only go to one restaurant for every restaurant week, but I think this time around I'll be trying out at least four new different restaurants. Sometimes I wish I can take the chefs home so they can just cook something for me when I want to and just eat. I love good food. Oh, and if you follow me on Twitter or Instagram, you probably already know that I recently re-did my ombre highlights. I'll show it on the next outfit post on how it turned out. It's a lot blonder now, but for whatever reason day two looked really brassy that I almost hated it. But it's a lot better now that the color has settled I guess. I hope everyone will have an amazing weekend! Any plans? Or anyone else doing dineLA tonight? I'd love to know if you have any restaurant suggestions that you love. Your highlights look very good. 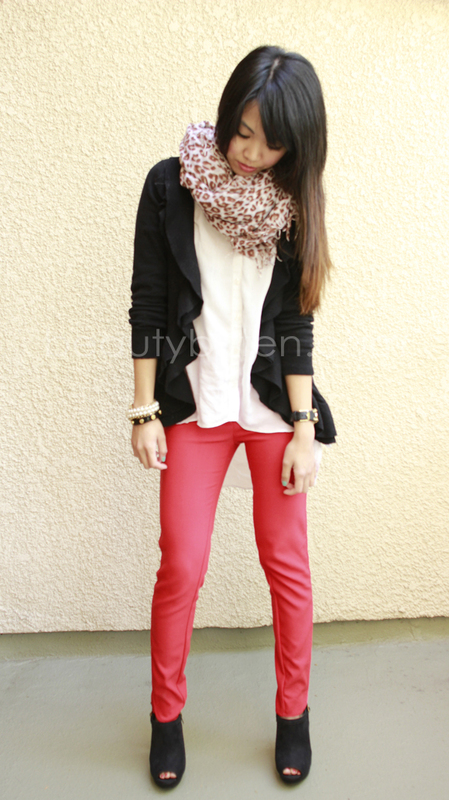 Love the pants and the scarf combo. Love your hair! I love your scarf too! :D Have a fun weekend! Love this look a lot! The scarf is amazing, I want one!